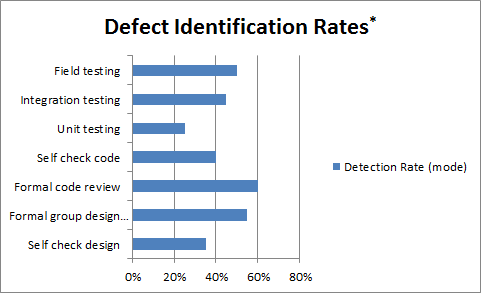 Based on this data, we see that formal reviews of the design and code are much more effective at finding defects than unit testing. In this case, unit testing is focused on branch coverage. Obviously, changing the testing expectations, such as applying domain testing concepts, might change the effectiveness. My guess is that such a change would not bring unit testing on par with formal code reviews but would improve its performance, at a cost of productivity – since domain testing takes more rigor to apply. As Capers points out, these percentages can’t be added together. In other words, there is an intersection of the defects found by these methods. In his studies these methods found some of the same and some unique defects. Therefore, this data does not provide a defense to skip unit testing. 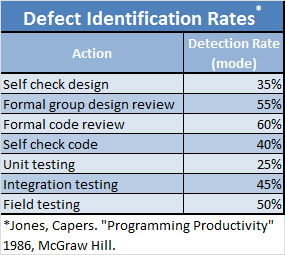 Instead, each defect detection method should be used in a complementary fashion. The statistical data does inform us regarding level-of-effort decisions. Also, we can use this information to help define where to cut corners, if necessary. If we have to reduce the time we spend in the testing phase, we would do better to give up some unit testing in favor of keeping more formal code reviews. This isn’t always the way we approach such situations. It is easy to skip the formal reviews, believing that the time would be better spent by developers creating more tests for their code. Apparently this is not the case. I think it is valuable to periodically remind ourselves about studies like these as a way to make sure we aren’t falling into bad habits or being misled by incorrect assumptions. Also, as teams bring on new members, it is good to review our practices, understand the relevant literature and actively discuss why we do what we do (and whether it needs to change). A parting thought about statistics like the ones quoted here. They are an average from a very broad array of problem types and development shops. As Boris Beizer has pointed out, each shop has a “bug fingerprint”. The bug fingerprint is impacted by things like the technologies being used, types of applications being developed and the experience of the team members. 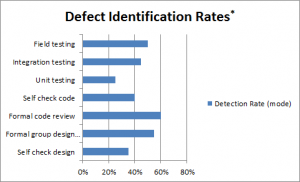 Further, different types of bugs are better identified through different detection methods (branch tests, domain tests, code inspections, etc.). Therefore, the optimal set of testing approaches for a given group of developers will differ somewhat from the average. I’ll discuss this in a future post. What does your team do in regards to testing and inspections? Are there other techniques you find useful for identifying software defects? I welcome your comments and feedback. This entry was posted on Tuesday, October 11th, 2011 at 23:28	and is filed under Quality, Software Development, Testing. You can follow any responses to this entry through the RSS 2.0 feed. You can skip to the end and leave a response. Pinging is currently not allowed.